Now that the air strategy is taken care of, it’s time to discuss the lodging options. This is where it gets more complicated (or interesting, if you’re me). Hotels are a totally different game. There are more options and more ways to get a good deal. My friend and his wife want to stay in a luxury hotel for 5 nights in Bora Bora. They’ve already gone there before and stayed at the best Overwater Bungalow (OWB) at the InterContinental Thalasso so doing that again may not be a priority. With this information, I was able to put together a list of potential hotels along with ways of getting cheap/free nights. 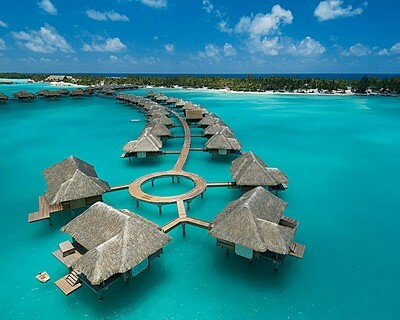 This is, by far, the most pain-free way to ensure discounted luxury lodging in Bora Bora. By using the Priority Club “Points & Cash” trick (detailed here) to buy points at $0.006 per point, you can essentially secure a room at the Thalasso for $240 a night. The cheapest room in this place is $900+ a night for June 2012. Over 5 nights, you’re saving $3,410!! Also, if you contact the hotel a month or two before your stay, you can arrange to pay a co-pay (usually about $250 more per night) to upgrade from that standard room into an OWB. You can also purchase IHG’s Ambassador status for $200 and that will give you a free weekend night (that you can use at Thalasso) and an automatic one-room upgrade. Any way you slice it, you are looking at substantial savings. One reward night here costs 50k points and it gets you a King Lagoon View Suite. It is not an OWB but it is a large 2-story suite with a private balcony. The going rate for this room is $750 a night in June 2012. Again, you can always contact the General Manager of the hotel to request an upgrade to an OWB (paid or not). There are no easy ways to earn Hilton points but there are always options. There are a few Hilton credit cards available – 1) Citi Hilton HHonors Visa with a 40k sign-up bonus and 2) American Express Hilton HHonors with incentives to earn 62.5k points. You can also transfer your Amex MR points to Hilton at the ratio of 1 MR to 1.5 HH. Not bad, but I can think of better ways to use an MR point. Another lesser known option is transferring American Airlines miles to Hilton. The ratio is 1 AA mile = 1.67 HHonors points. Combine that with the 150k AA payday and that amount of miles could transform into 250k miles – just enough for 5 nights! These are both Category 7 (top tier) hotels for Starwood and thus, they are probably the worst value for your Starwood points. I just called Starwood to check availability for June 2012. St. Regis has NOTHING in the way of award nights and Le Meridien costs 60k a night. With minimal ways to earn a lot of Starpoints, I would stray away from either of these for free nights. However, feel free to book an OWB for about $1200 a night! Since Four Seasons does not have a loyalty program, there is zero chance for a free night opportunity. Any Four Seasons is worth mentioning though, and if you want to stay at this resort, you can contact a Four Seasons Preferred Partner (FSPP) or a Virtuoso travel agent. While there may not be any discounts, booking through either of these is FREE and the stay comes with amenities like guaranteed late checkout, a room upgrade if available, and a monetary benefit (e.g. $100 food or spa credit). I used a great agent who is both FSPP and Virtuoso and he was very professional, always available, and handled everything I could think of with regard to a luxury booking. And again, their services are FREE. If you made it to the end of this post, congrats! That took a while but it shows how there are several creative ways to score free or discounted hotel nights. Remember, this projected vacation is in 3-4 years so my friend has all the info he needs to pick a strategy and go full steam ahead. Very nice summary of the hotels in Bora Bora. I agree with you, that Starwoods is the lease appealing of the lot because they want a lot of points for a room night. Thanks, Daraius. I appreciate the comment! I know this is semi-unrelated but one big deciding factor on why we stayed at the Intercontinental Thalasso (vs the St Regis, which happened to be closed due to hurricane damage) was the free boat transfers. It was one of the only hotels providing the free shuttle, but this is no longer. Now, it is appx 4000 cpf+VAT per person one way. This is about USD$50 ($200 for a couple round trip). If traveling on a budget and assuming you may want to get away from the hotel (and motu) every so often, one may need to consider choosing a hotel with OWB on the main island, rather than the motu. Intercontinental Le Moana is on the island. Of course, hotels on the motus facing the mountain are most desireable.